CLICK TO ENLARGE. All charts and companion articles are available For You and For Your Business. That’s weird…why is this post written in third person? Because it was written by Lisa Kurtz, Director of Operations and Training for the Association of Personal Photo Organizers (APPO), that’s why! Her original blog post is only viewable by APPO members, so she agreed I could share it with you here. As a newly-certified APPO member, I’m proud to add this chart to my Clutter Flow Chart Collection, and delighted that Lisa and APPO Founder Cathi Nelson liked it too! Professional Organizer Hazel Thornton created the Clutter Flow Chart Collection to help her organizing clients continue the decluttering process when she wasn’t by their sides. She also leverages these handy charts as marketing pieces for her business. Her charts soon became popular with her colleagues so she developed Custom Branded Clutter Flow Charts for Professional Organizers to purchase and use in their own businesses. Check out the many endorsements from her peers. Using the same ‘easy to follow’ flow used in her original series, Hazel has added the Photo Clutter Flow Chart to her collection! In addition to the Flow Chart you get a custom branded companion article to include with the chart. If you are interested in a custom branded Photo Clutter Flow Chart and companion article, head on over to Hazel’s website to learn more. E-mail, mail, or hand directly to prospective clients at networking meetings and events. Congratulations, Hazel! It amazes me that you’re able to keep coming up with these creative tools for organizers and their clients. Congrats Hazel! I love your creativity with your charts. Could there be any occasion that might not merit a new chart? Probably not, sez me. I’m also so impressed at how you always find new ways to serve your clients. Thanks, Moreen! You’re right….the opportunities for new Clutter Flow Charts are endless. The trick is letting people know about them, and not overwhelming them with choices! What a ringing endorsement! 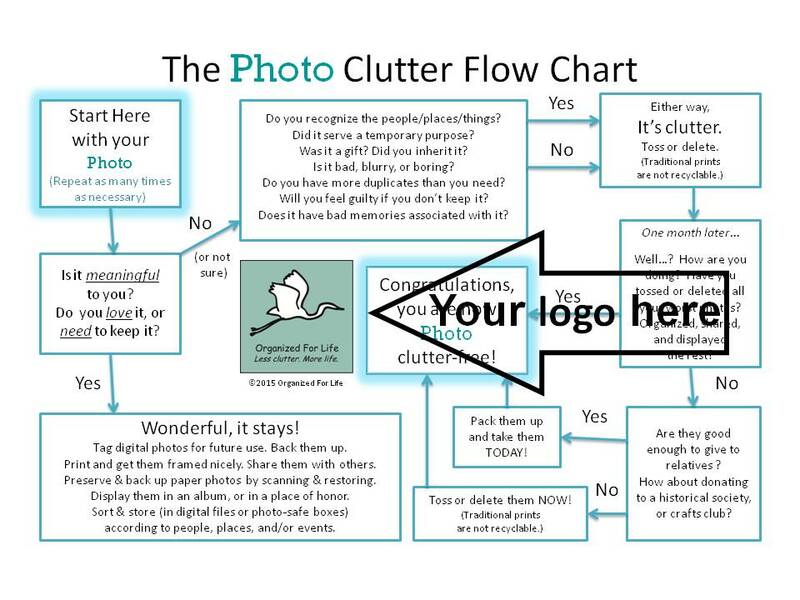 Being a visual person, flow charts make so much sense in moving you through the process of de-cluttering! Hi Sarah! I created them for my clients, but they also help newbie organizers walk their clients through the decluttering process. Not to mention the marketing possibilities. This is such a great resource, Hazel! I can see it really appealing to visual learners, like me. Thanks for sharing. Glad you like it, Andi! Tell your friends! I LOVE the flow chart!! Thanks so much for sharing! I’m ‘pinning’ it for sure!! Glad you love it, Kate! If you think it will be helpful to share with your clients, and to use for marketing to new prospects, don’t forget to place your order for a Custom-Branded chart for your business!